Welcome to “Locanda – Demenagas”, Hellenic restaurant! The owner of the restaurant, Eleftherios Demenagas, promises you a warm welcome with a company that will transfer you into culinary dreams, found only in the old recipes and flavours of our grandmother, ingredients and quality of local products, bathed in sunlight, watered by the saltiness of Mediterranean sea and the enduring power of Aeolus. We wish you “Bon Appetite” and a “Pleasant Stay” in this wonderful spot of the world, the island of the Knights, Rhodes. After a successful career in banking industry across the world, Mr. Demenagas’ life-long passion for cooking became a reality with opening his own restaurant at Rhodes, Locanda – Demenagas Greek Restaurant. Cooking for friends and family was always a pleasant activity but during 2010 he decided that he had to step out of the banking industry and focus on his passion for good! He rejected an offer for a promotion to top management position in a private Greek bank and created one of the most popular Greek restaurants in Rhodes. Being a sharp entrepreneur he spotted that Rodos restaurant space was missing a traditional Greek restaurant that would cater primarily locals and of course visitors that wanted to taste authentic non-touristy Greek cuisine. 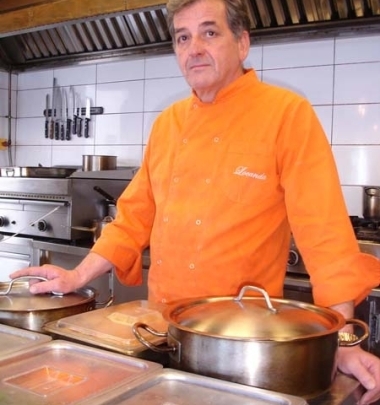 Along with his family he gave priority to welcoming and serving his guests with a unique eating experience and managed to make Locanda a top eating destination for locals – business people, celebrities and politicians – and visitors.